In partnership with the Loftus Branch of the WI, Saint Leonard’s Parish Church Loftus is to host its first ever Christmas Tree Festival over the weekend on Friday 16th December 2016 – Monday 19th December 2016. 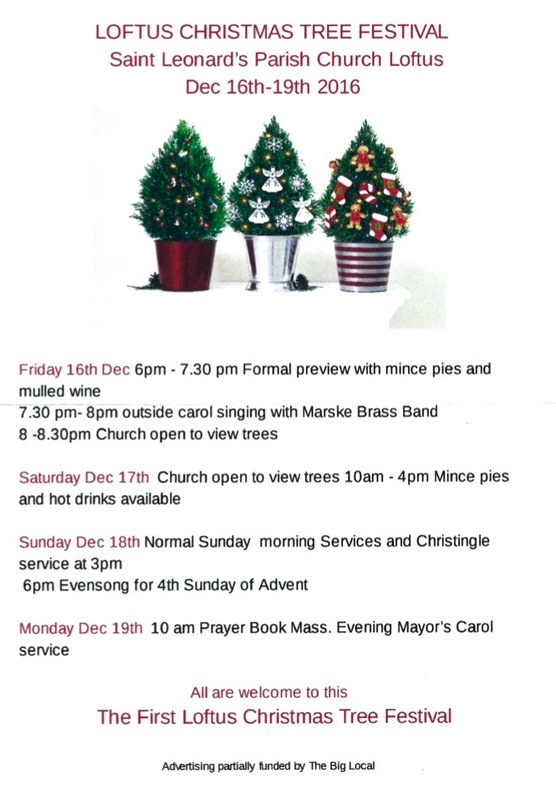 Over the course of the weekend refreshments will be available in Saint Leonard’s Church, with this special event formally beginning on Friday 16th December with Carol Singing accompanied by Marske Brass Band. The Christmas Tree Festival will formally conclude with the Mayor of Loftus’ Civic Carol Service on the evening of Monday 19th December. All are encouraged to attend this community event and further details are outlined on the poster below!